A powerful SLK320 with just 25,760 miles. 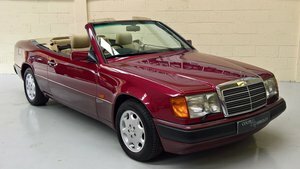 HISTORY A UK spec car imported direct from the German factory by the first owner (all duties paid with documents to prove), our four owner car shows four Mercedes dealer stamps in the service book at 6,300 miles, 11,250 miles, 18,100 miles and at 25,500 miles in February this year. We have some old MOT certificates and the current test expires 23rd August 2019 with no advisories. SPECIFICATION Spec includes: Brilliant Silver paint, Magma red leather with black dashboard,driver and passenger airbags, armrest with storage box, outside temperature gauge, brake assistant, additional 3rd stop-lamp, anti-theft alarm system, ESP, power windows, automatic 5-speed transmission, air conditioning, leather steering wheel and leather shift lever, mechanically adjustable steering column, cruise control, MB radio with 10 disc CD, 5 spoke light alloy rims, heated seats, dust filter, heat-absorbing glass, electronic immobilizer with infrared remote control and central locking. The SLK private plate comes with the car. CONDITION In wonderful, original condition throughout with no dings dents or scratches. Wheels are excellent and never refurbished. 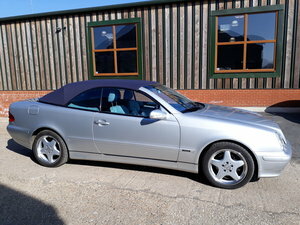 The interior is in fantastic condition with no rips or tears to the seats and shows none of the usual SLK rub marks on the door cards or centre console. The Pirelli tyres are in excellent condition with plenty of tread all round (one is brand new). HPi clear with certificate in hand and a full set of working keys. CONTACT US We are 30 seconds from junction 2a off the M26 and 5 minutes from junction 2 off the M20. Viewing strictly by appointment. Call us ANYTIME on 07711 645 465 to view or for a friendly chat. Part exchange considered. All our cars are prepared to the highest standards and can be viewed in our brand new fully lit unit, day or night. Finance is available on this car.